P is for people. P is for peace. P is for peaceful protest. P is for prepared. New mother Channy Leaneagh educates children (and puppets) in the video for her band’s single ‘Wedding’ about the world they will inherit in the foreseeable future. In a style that crosses Sesame Street with Charlie Says, it specifically warns kids to be cautionary about the American police force following the uprise of law enforcement brutality. Poliça frontwoman Channy gained a reputation of smart and opinionated lyrics across the Minneapolis group’s first two albums; the debut Give Up The Ghost was bitter about marriage and mortality and the follow-up Shulamuth called for feministic independence (emotionally and financially). After giving birth to her first son during the recording of their third album United Crushers in Texas’ El Paso, Channy’s motherhood instincts have seemingly contributed to specific lyrics about protectiveness and guidance, with ‘Wedding‘s “All the cops want in/Brim brim when they lose and win/Saying hands up/The bullets in,” being one example of this life risk assessment. ‘Summer Please’ is particularly grim in its outward looking honesty: “Whatcha wanna be when you’re big enough to see it’s all sh*t?”. Furthermore, intimate relationship abuse and the manic pressures of modern life are contrastingly compared to the tranquillity of a “babies breath” in this particular anthem. It’s unsurprising that Channy is not going to be a mother that pretends that the world is sunshine and rainbows for the sake of her children’s fantastical childhood, especially if you saw the bleeding album cover of Shulamith and the controversial self-violence of video ‘Tiff’. However, the pureness in Channy’s voice is unexpected. 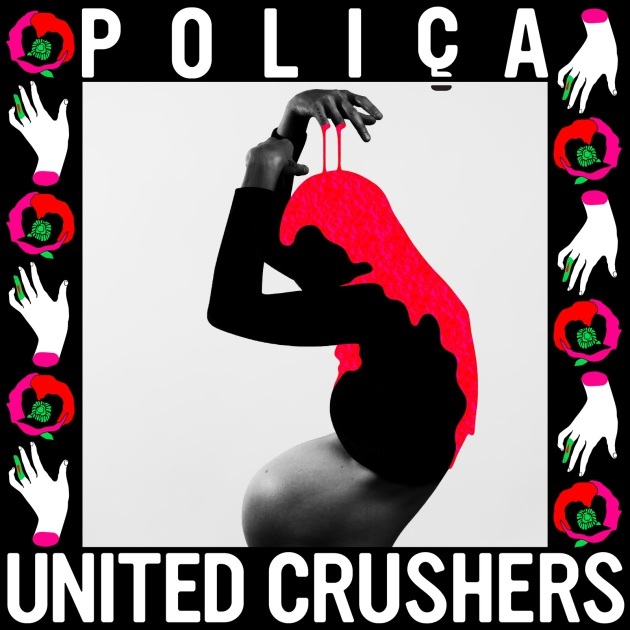 Ever since the hypnotic ‘Lay Your Cards Out’ was released in 2011, audiences have grown accustomed to Poliça’s artistic and credible use of autotune effects, as much as the frantic speed of Drew Christopherson’s drumming. Yet on the teaser song ‘Lime Habit’, ‘Someway’ and many others tracks on United Crushers – with the exception of final track ‘Lose You’ – there aren’t the usual echoey manipulations to the vocals. As Poliça have that contradictory skill of sounding different and yet strangely familiar musically, Channy’s less clouded vocals aren’t out-of-place. Neither is the introduction of patient sniffy drumstick beats – the type that could accompany alternative British hip hop Ghostpoet or Roots Manuva – ambient techno effects and Chris Biersen’s funky bass guitar groove carrying the rhythm.